Melania Trump triumphed at the State Visit and especially the banquet for the French president and his wife, which she had organised. She dresses with great style and seems to be coming into her own. Unusually she was smiling happily at the photo shoot at Barbara Bush’s funeral surrounded by former Presidents and their wives, with her husband noticeably absent. She still looks stony-faced when he’s by her side and flinches when he takes her hand. But she’s almost the only one of his close circle who hasn’t been diminished by association. The #freeMelania campaign is alive and well and her popularity is rising. When Uranus moves into Taurus on May 15th tr Uranus will oppose her Jupiter which is usually luck and relief; but also squares her Mars/Pluto which suggests a disaster or a catastrophe – so something bad with a good outcome. Clouds and silver linings. That repeats mid-October and early in 2019. Into 2019, there’ll be more good fortune arriving suddenly; with her confidence and success-factor rising as well with tr Pluto trine her Mars/Jupiter into 2020 as well. By mid 2019 tr Uranus is conjunct her Sun, on and off into 2020 which will bring considerable changes and perhaps a more rebellious spirit. She still looks trapped and frustrated at points but she’s a determined and resourceful lady with her Sun, Saturn, Mercury and Venus in Taurus, the latter two trine Pluto. Her 11th Harmonic is strongly marked and practical which is the ‘obsessive dream’ one, giving her stamina to follow her vision. Though the downside is disloyalty and betrayal by others. 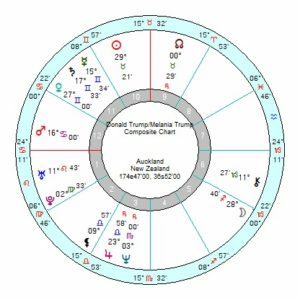 Her relationship chart with Trump isn’t exactly awash with affection and is fairly controlling with a composite Sun square Pluto. It has been under considerable strain through his campaigning and first year in office. But the power balance will shift come this July as tr Uranus starts to trine the composite Pluto, on and off into 2019. 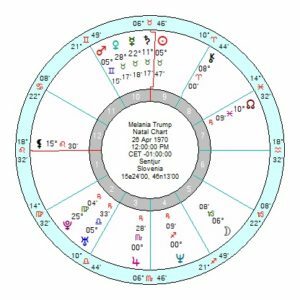 With evasiveness and miscommunications rife this year and uncertainty next as tr Neptune squares the composite Mercury Saturn. Indeed tr Uranus from mid May will conjunct the composite North Node which may be the first inkling of a change in their joint destiny. It’s just been announced Marjorie that Trump visits here on 13 July next. Any thoughts re date/s? Oops day of the Cancer Solar Eclipse conjunct his Saturn. Will do a piece. Melania lived in Paris in her 20’s, and was roommate of Victoria Silversted, a Swedish bombshell who also was a Miss Sweden. Victoria describes her as a very disciplined and tidy person at an interview with Italian Television. There’s nothing on that chart to contradict that. But given Melania spent a year or two in France, I suspect her French is quite possibly almost at the same level her English is, or even better. 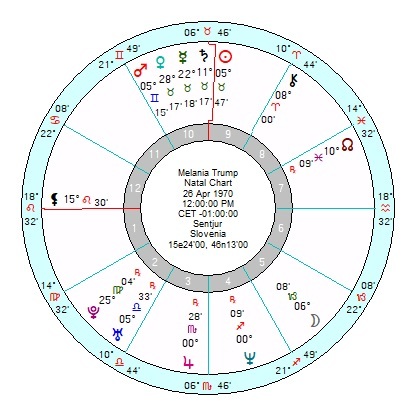 I think this showed – Caprocorn Moons can be incredibly selfdoubting, but here, Melania probably knew she had an upper hand not just towards her husband, but much of the painfully monolingual (and if a second language is spoken, it’s Spanish) White House staff. Thank you for your profile of Melania Trump, Marjorie. I can definitely see the determination. Her elegant composure is something to behold. She dwarfs her ogre of a husband in every way. Based on your post (all that Uranian activity! ), I think it’s very likely she’ll be leaving him behind and starting anew (as a successful businesswoman in the fashion industry perhaps). It was such a joy to see her smiling while in the company of the Obamas and others at BB’s funeral. I’ve long had the notion that she will soon file for divorce from Trump, something that she may have been working on secretly. The Stormy Daniels situation, bringing much humiliation, now gives her moral grounds for getting full custody of her son Barron. His well-being has probably be foremost in her mind, and she’s felt unable to disentangle herself from Trump. Now her own financial jeopardy, as spouse, could urge her to get out of the Trump World money malaise before she finds herself caught up in tax audit and legal hassles herself. In fact her divorce proceedings might be the ultimate can opener for the Trump taxes. 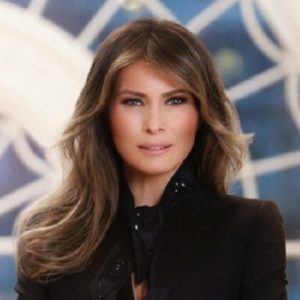 Her obvious self-confidence boost, as she moves into the circle of other Presidents and First Ladies and State Dinners accomplished, may give the courage to separate herself from The Donald and his abusive environment. She’s probably tired of being in Ivanka’s shadow all the time too. Indeed. More power to her elbow!